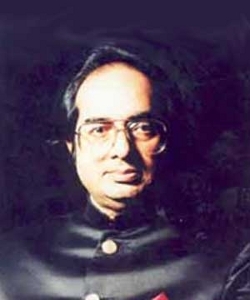 Ananda Shankar (11 December 1942 – 26 March 1999) was a Bengali musician best known for fusing Western and Eastern musical styles. He was married to Tanusree Shankar. Born in Almora in Uttar Pradesh, India, Shankar was the son of Amala and Uday Shankar, popular dancers, and also the nephew of renowned sitarist Ravi Shankar. Ananda did not learn sitar from his uncle but studied instead with Lalmani Misra at Banaras Hindu University. In the late 1960s Shankar travelled to Los Angeles, where he played with many contemporary musicians including Jimi Hendrix. There he was signed to Reprise Records and released his first self-titled album in 1970, featuring original Indian classical material alongside sitar-based cover versions of popular hits such as The Rolling Stones’ “Jumpin’ Jack Flash” and “The Doors’ “Light My Fire”. Returning to India in the early 1970s Shankar continued to experiment musically and in 1975 released his most critically acclaimed album, Ananda Shankar And His Music, a jazz-funk mix of Eastern sitar, Western rock guitar, tabla and mridangam, drums and Moog synthesizers. Out of print for many years, Ananda Shankar And His Music was re-released on CD in 2005. After working in India during the late 1970s and 1980s, Shankar’s profile in the West began to rise again in the mid-1990s as his music found its way into club DJ sets, particularly in London. His music was brought to a wider audience with the release of Blue Note Records’ popular 1996 rare groove compilation album, Blue Juice Vol. 1., featuring the two standout tracks from Ananda Shankar And His Music, “Dancing Drums” and “Streets Of Calcutta”. In the late 1990s Shankar worked and toured in the United Kingdom with London DJ State of Bengal and others, a collaboration that would result in the Walking On album, featuring Shankar’s trademark sitar soundscapes mixed with breakbeat and hip hop. Walking On was released in 2000 after Shankar’s sudden death from heart failure the year before. In 2005, his song Raghupati was used on the Grand Theft Auto: Liberty City Stories soundtrack, and in 2008 his song Dancing Drums was used on the LittleBigPlanet soundtrack. Recently, 2010 and 2011, his music has been featured in a number of episodes of popular NBC comedy show “Outsourced.” Following is a list of episodes and music featured: Episode 103: Party of Five – 10/7/2010 – Night in the Forest. Episode 105: Touched By an Anglo – 10/21/2010 – Dancing Drums. Episode 106: Bolloween – 10/28/2010 – Radha — inst.. Episode 107: Truly, Madly, Pradeeply – 11/04/2010 – Dancing Drums. Episode 109: Temporary Monsanity – 11/18/2010 – Dancing Drums. Episode 110: Homesick to my Stomach – 12/02/2010 – Renunciation. Episode 112: Sari Charlie – 1/27/2011 – Exploration. Episode 114: The Todd Couple – 2/10/2011 – Cyrus.